Study abroad students in Japan introduce their beloved universities, bringing you real info! Many Nobel Prize recipients have passed through Kyoto University, on go Japan’s top emulated universities. There are many world heritage sites located in Kyoto, including Nijo Castle and Kiyomizu Temple. One of the three most scenic spots in Japan is located on the Sea of Japan side of Kyoto, at a place called Amanohashidate. Homemade dishes such as Obanzai etc are also attracting attention for the unique food culture that they form a part of. Kyoto University has a very international air about it, with international students from approximately 100 different countries enrolled there. In this edition of the show, Tseng from Taiwan and Rios from Indonesia introduce us to their respective research labs and groups of friends. In the latter half of the show, they guide us around Arashiyama and Gion. They take us a number of sightseeing spots, such as a small path in a bamboo forest that continues for 100 meters, a Buddhist statue that has been designated as a national treasure, and a gigantic bell known as a bell of happiness that we ring for good luck! After all that sightseeing, Tseng takes us to one of his favourite cafes, where we take a break as we enjoy the matcha free tea sweets at a green tea establishment that has been running for over 150 years, called Tsujiri. Lastly, we take part in a Koto (traditional Japanese instrument) lesson, to round off a thorough day of enjoying what Kyoto has to offer. This environment where we can interact with Japanese culture from long ago on a daily basis could be said to be ideal for international students. Both daily life amenities, and attractiveness of location are important elements when choosing the perfect location to study in Japan. What we want you to really pay attention to with Catch Your Dream, is the reality of life for the international students that feature on the show. For those of you interested in studying in Japan, go ahead and try to image yourself hard studying at one of the places featured on this show! And what’s more, an easy to read app is also on its way. 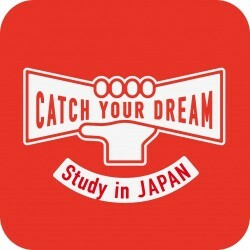 The app will be connected to ‘Catch Your Dream’, and users will be able to check out details of the show via the app! Check it out if you are thinking of studying in Japan, or are interested in education in Japan. The next edition of Catch You Dream will take us to Kumamoto University in Kumamoto Prefecture, well known for its famous character Kumamon!